If you’re looking for your future Chrysler, then you need to visit the Chrysler Showroom in Elmhurst, IL, and enjoy all the benefits we offer. Whether you want any of the new Chryslers, or you are looking for an excellent used car or minivan, the Chrysler Showroom in Elmhurst, IL, has everything you need in one place. Comfortable Chrysler 300, a modern Pacifica or fuel efficient Pacifica hybrid await you at the Chrysler Showroom in Elmhurst, IL, to test them and buy at the best prices. If you want a large high-performance car that will provide you with a comfortable ride, then you have found the car you need. The attractive Chrysler 300 will easily satisfy your driving needs and you will love its spacious, luxurious interior that comes with a long list of standard and available features. Chrysler Pacifica is a perfect family minivan with seats for seven passengers. Stylish, comfortable and with lots of advanced technology, Pacifica provides a fun driving experience. It is more affordable than most of its competitors in the class. Chrysler Pacifica Hybrid is the only minivan hybrid on the market and it is one of the most efficient vehicles in the class. Pacifica Hybrid is a great minivan with spacious, quality interior with long features list. Why Buy from Larry Roesch CDJR of Elmhurst, IL? 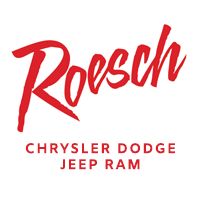 Larry Roesch CJDR in Elmhurst, IL, is a dealership you have always wanted. Not only that you will find here the largest selection of new and used Chrysler, Jeep, Dodge, and RAM, but we have already prepared fantastic prices and payment terms that every driver can afford. Our dedicated staff is at your service for all your questions whether you need assistance in choosing a vehicle, a financial option, or maintaining your Chrysler, Jeep Dodge or RAM. The years of experience and commitment have made Larry Roesch CJDR in Elmhurst, IL, the first choice for those who want professional service and a pleasant shopping experience.